Georgian Health Minister David Sergeenko has confirmed that the investigation is underway regarding the Hepatitis C Drugs which were expired in April. 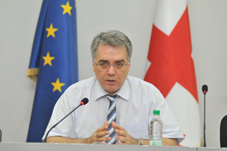 Sergeenko stated that the hepatitis C elimination program is a large-scale project and Georgia receives medicines for free [from the US] and investigative and supervisory bodies always control such projects. "No specific offense has been revealed yet, but the investigation is underway to conduct a triad - prevention, detection, reaction. This is a function of controlling bodies, and we do not interfere in the process", said Sergeenko. Sergeenko stated that international partners, the Georgian National Center for Disease Control and the pharmacological company that donates this medicine participate in the project, there is also an International Advisory Board, which meets twice a year and provides Georgia with recommendations. “One of the first recommendations in 2016, when we overcame the first wave of treatment of the patients with the most severe forms, was that we had to treat minimum 3, 500 patients per month to ensure that the planned elimination was implemented within the set terms. Our target was 3,500 patients per month. So we have calculations based on the number, recommended by the International Advisory Board and are taking steps to be completed. Despite the monthly average target was 3,500 - we had only 1, 000 [patients],” Sergeenko said. “The order for the medicines is agreed with the International Advisory Board. In April, a certain amount of medicines was ordered for 3,500 patients per month, and the flow was 1, 000 patients and the drugs were expired. It is bad, but the state did not suffer losses, because it is a donation and they give it to us free,” said Davit Sergeenko. 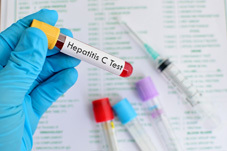 The Hepatitis C Elimination Program launched in 2015, has admitted almost 50, 000 patients. 98.2% of them have been cured, Health Minister says. Typically the Hepatitis C treatment costs ˆ110,000 per person, which is unaffordable for the majority of Georgians.